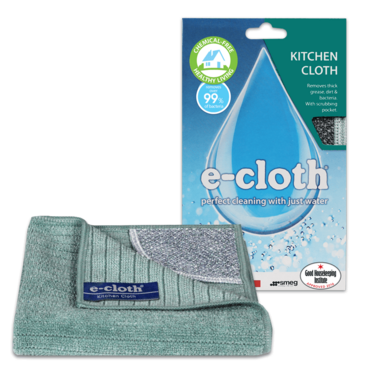 The e-cloth Kitchen Cloth, with nylon scrubbing pocket, loosens and removes thick grease, dirt and bacteria using just water. The durable and highly absorbent Kitchen Cloth with its gentle scouring pocket, effortlessly lifts, traps and removes all stubborn stains, grease and bacteria from kitchen surfaces and appliances, all with just water. Directions: A hot rinse under a tap is often enough for day to day use. Recommend machine wash once a week and tumble or hang dry. Made from 80% Polyester and 20% Polyamide. Do not use bleach or fabric softener.